Today, we are asking more and more of our young leaders. I believe strongly that schools should lead the way in educating for a better world and that our young leaders should be at the vanguard of these changes. I feel we have a responsibility to give the girls the skills to shape the future in a positive way. One key way the girls learn about leadership is through ‘doing’ and therefore we believe leadership opportunities should be spread across the whole school and not just restricted to the Sixth Form and Year 6. This week is Leadership Week. 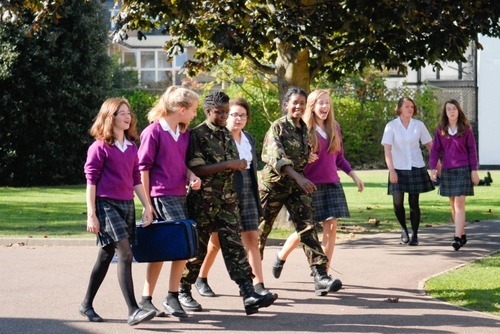 It is an opportunity for girls from Years 7 to the Sixth Form to apply for leadership roles in the school. To celebrate Leadership Week, we have invited in outside speakers to work with the girls, to give them a greater understanding of what we mean by leadership and encourage them to be bold and take up the challenge of a leadership role at some point in their school life. Last week, former alumnae Megan Reitz spoke to the whole school on leadership. Megan has just completed her doctorate on leadership and has worked with companies such as BP, News International and the BBC to help them understand what makes a good leader. Megan had three simple messages. First every girl should consider a leadership role. Too often we suffer from the “imposter syndrome” where we think we are not good enough or capable enough to do the role. All good leaders question their ability; it is this reflection that makes them better at leading. Rising to the challenge and being taken out of your comfort zone encourages you to demand more of yourself and therefore be better as a result. Secondly, all leaders need followers and sometimes being a follower is as important as leading. All great movements begin with someone leading, inspiring others to follow and in that action of being followed allows the change to occur. This is something our Girls Leadership Team would endorse; their campaign to make a difference to girls’ education was widely supported by the school and allowed them to raise money for a school in Uganda. Finally, girls should observe in others what makes a good leader. She encouraged them to look in their everyday life. Girls in their Form who lead a sports team, take on a major role in a school play or lead on a school project. She asked what were their characteristics and what made that person stand out? We can learn every day from each other. There is no one trait that makes a great leader but watching people who have the ability to make a difference, no matter how small, can encourage others to try. We want girls to recognise and develop the skills of leadership and ask them to apply for positions of responsibilities where they can drive the agenda for change. Leadership is not a popularity contest at Bedford Girls’ School. It should not be reserved for a few popular individuals who win the most votes. In applying for the positions and then being interviewed the girls are forced to consider what the role entails and whether the role plays to their strengths. I look forward to working with our new young leaders and seeing how each girl shapes their role to the betterment of the group, to make a positive difference to the lives of others.